The Expanse has been saved. Fans already know this, of course, but if you’ve been in the shadow of an asteroid for a few months and you missed it, the news is good: the Roci’s still flying. If you never saw the Expanse, it might be tough to understand the excitement. If you did, you don’t need an explanation. The Expanse brought traditional science fiction back into the mainstream. No warp drives for these guys, and no sanitized future of jumpsuits, holodecks and superintelligent clouds of blue gas. Mark Fergus and Hawk Otsby’s adaptation of James SA Corey’s series of novels stands on the shoulders of Asimov and Heinlein just as much as the cyberpunk progenitors of a used future where the street finds its own uses for things, even if the street is in space. It got plaudits from the pundits, cheers from fans who were finally being given something to get their teeth into, and nods from science fiction’s most forward-looking elders. One Hugo. Three Saturn nominations. Well, even if you didn’t know, you’d be able to guess what came next. Home network Syfy declined to renew the series for a fourth season in May last year. The issue was the deal Syfy had which placed excessive value on live, linear viewing. Good luck with that in 2018, and especially in sci-fi. In response, fans organized Twitter and other social campaigns, backed by the promise of real cash if a network picked it up. The hashtag #ScreamingFirehawks became a rallying point and an umbrella term for ardent fans. A plane was crowdfunded to fly a banner reading ‘Save The Expanse’ round Amazon HQ and an online petition garnered over 100,000 signatures. Voices raised in support of the show included not just Jo Fangirl, but George R. R. Martin, Patton Oswalt, Andreas Mogensen and Wil Wheaton, all of whom supported the campaign to save the show. Even William Gibson joined in, sort of. Seeing that the show had effectively been crowdfunded by its fans and that anyone who picked it up would attract a significant number of new subscribers willing to sign up just to watch the show, Amazon picked up distribution less than a month after Syfy announced cancellation. 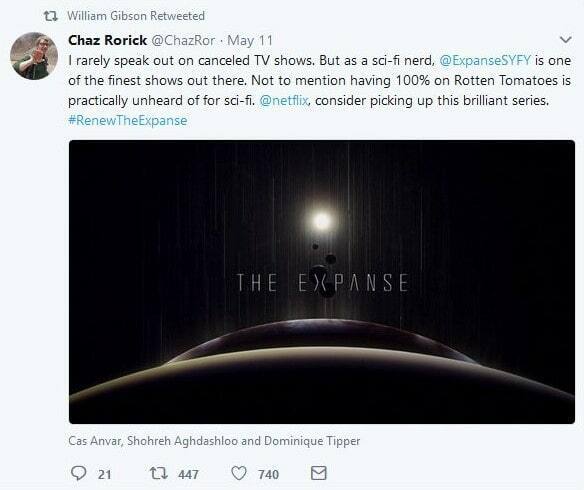 Why do so many people care so much about The Expanse? The Expanse is exciting, not cerebral; cynical and sceptical, not utopian; dirty, rough and complex, not wish-fulfillment. It’s a fun watch that treats its audience like adults, letting you do your own Googling if you don’t understand why you can’t hear anything in space or water flows sideways inside a rotating space station. The characters are out of central casting — if you were minded to be cynical you could say they were straight out of Robin Hood. Big, strong sidekick, suited to violence, none too empathetic? That would be Little John Amos. What about a sympathetic lead character who fights the power and gives to the poor, but comes from wealthy beginnings? Say hello to Robin Jim Holden. There’s a knight errant (Miller) and a damsel in distress (Julie). Yes, you can see some of the rivets. No, that doesn’t detract from the show’s appeal. In a market stuffed with magic, werewolves and post-apocalyptic teenagers in astringent lighting conditions, The Expanse is a welcome breath of compressed air because it treats its characters like adults too. Bad things happen to them. They face impossible choices between two unthinkable options, and have to live with the consequences. Some of them even die: no wonder George RR Martin likes it so much. There’s also good old-fashioned fighting in space, hunting spaceships in the asteroid belt, and punch-ups under artificial gravity and filtered air. Gunfights and socks to the jaw live side by side with serious considerations of collapsing artificial ecosystems that are a little too close to home, perhaps, but the show is never didactic or moralistic. What is The Expanse about? The show follows a group of survivors of an industrial accident in space as they seek to discover the reasons behind the crash. The plot soon thickens and leads the group, now crewing a salvaged Martian Navy ship renamed the Rocinante (after Don Quixote’s horse), into the three centers of power and intrigue in a near-future colonized solar system. Impoverished, polluted and overpopulated, Earth has a world government and a monopoly on naturally livable environments. Hardscrabble and militaristic, Mars halted its terraforming program to pay for a war with Earth that was fought to a standstill. Outside the inner planets, Belters live in the asteroid belt and moons of the outer planets: diffuse, poor, Belters struggle to survive in a hostile environment. Within this, the plot centers around a substance assumed to be from an alien source which can assume any form and which is able to both build conscious networks and to invade other conscious beings and use them as hosts. Some Alien-style body horror aside, this isn’t a new take on a nebulous intelligence that wants universal harmony, like some kind of meditation-happy, intergalactic gaseous Kant. No-one knows what it wants, but it certainly has no compunction about eating people. Naturally, it’s immediately seen as a weapon and the various factions’ political infighting as they struggle to control it forms much of the show’s plot. How do I watch The Expanse online? Amazon will be streaming the show’s fourth series sometime this year, though as yet we don’t know when. Seasons one and two are available on are available on Amazon Instant Video, having left Netflix when Amazon bought the show. Not sure how Brooklyn Nine-Nine got in there, but still. No Expanse. Watching season three is a little trickier. Right now it’s not available on Amazon outside the US where it’s available on Prime Video. Sadly, Amazon isn’t just savvier when it comes to choosing which shows to screen than its competitors. It’s a bit more careful to make sure it protects rightsholders. The billing address on your payment method must be a valid address in the United States. So what do you do if it’s not? 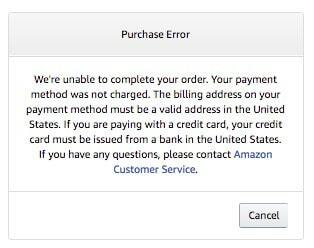 One option is to purchase Amazon gift cards, then remove your own cards from the account. This is favored by several people online who say it works just fine for them. Does it violate Amazon’s ToS? Could it be against the law? Could be: let the buyer beware. What does this bode for Season four viewers? It likely means you’ll be waiting a long time, or using tricks other than a simple VPN to watch the show. You should still look into getting one to unlock al your other streaming requirements, though: check out our guide to the best streaming VPNs!